Small Jaguar on its way? Reports from the UK suggest that Jaguar is planning to build a small sports coupe or hatch to compete in the market place with the BMW 3 Series coupe. 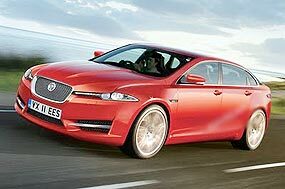 However, Jaguar designer Ian Callum said at the recent Frankfurt motor show the company had no desire to replace the unloved X-Type sedan with another conventional offering when the current model was discontinued. He believes there is an opportunity for a smaller niche vehicle in the Jaguar range; one with a unique silhouette, but apparently, this new smaller Jaguar is not waiting in the wings and is slated for release in 2014. It is believed the new model will use lightweight alloy and a new direct-injection V6 petrol engine to deliver the lowest fuel consumption seen on a Jaguar. Jaguar management is looking at ways of expanding its brand without repeating the mistakes of the X-Type, which dragged down the company’s image without delivering the much-anticipated volumes. At this stage, it looks as if Jaguar’s owners (the Indian Tata group) are allowing the marque to find its own level and to continue to use Jaguar’s own engineering base. Last week I mentioned that to get the name for their Road Runner, and a horn that went “Beep - Beep”, Plymouth had to buy the rights from Warner Brothers. I asked how much did they have to pay? Remember it was 1968. It was only $50,000 and Ivar Hoylem was first in again. I shall have to make the questions ‘Google-proof’! So to this week, and to beat the Googlers, what is this car? Cruden B.V. - the world’s leading designer and manufacturer of interactive motion-based racing simulators - is offering its new racing simulator as an extreme alternative to popular home gaming equipment for affluent motorsport and performance driving enthusiasts. The Hexatech - a professional full motion simulator with six ‘degrees of freedom’, realistic g-Force simulation up to multiple g’s, seatbelt tensioners and 100 percent realistic steering feedback - is normally found only in top secret Formula One factories and automotive research centers. Now, this same sophisticated equipment can provide the definitive motorsport experience at home, with prices for the base simulator package starting at the 6.6 m THB. The Hexatech is available as a three-seater (3CTR), where passengers sit either side of the driver to experience the ride together. Cruden can supply open or closed cockpits, fit bodywork or use actual vehicles, and apply the livery of a race or road vehicle according to customer preference. Owners can choose between three ‘wrap around’ 42 inch screens or (stereo) projectors to view their virtual world of state-of-the-art graphics. Friends and family can watch the race projected onto nearby screens or walls. There is a wide variety of software packages and competition settings to chose from, allowing customers to host fast lap shoot-outs, 24-hour endurance races and full championships, as well as to select race tracks and cars; for example from Formula One, rally, NASCAR and sports car racing. So there you are - what every rich kid is wanting for Xmas. On the motorway, many of you will have driven at 160 km/h (the old 100 mph, the magic ton, before we went metric). Some of you with a better motor car will have driven at 200 km/h. If you are very brave (or perhaps foolhardy), your BMW or Mercedes may even let you experience 250 km/h, but at that speed you will be hanging on for grim death, and praying there is no slow traffic in front. Let me now tell you what it is like at 300 km/h in a Lola T430 Formula 5000 racing car. The engine started easily and a dab on the accelerator produces a very deep growl from the engine behind your head. You know you have 550 bhp behind you. The Hewland gearbox on a car like this has no synchromesh, and the ‘dog’ gears select with a clunk and have a rattle at idle - this is not dangerous but it is disconcerting at first. The clutches on these race cars are not the soft pressure progressive clutches of a manual road car, and do tend to be in or out, so getting away from rest is a little tricky, but once trundling down the track you can begin to take stock of your surroundings and tentatively start driving this heavy beast with a little more throttle and some precision. At low speeds, the engine with the full race camshafts is very “lumpy” but soon you begin to use more loud pedal and drive the car deeper into the corners. By making the front tyres bite as you turn in under brakes, you could then feed in the power to control the rears and avoid too much oversteer. With all the horsepower at your disposal, cornering is done by the right pedal, and corrections are done by the steering wheel! You could leave the braking so late, you begin to think you will never slow down in time - but you can. In fact, sometimes I had to lift off the brake and use some throttle into the corner as I was braking far too early. The next adjustment you have to make is for the acceleration of race cars like this. Zero to 100 km/h comes up in less than three seconds. You are no sooner out of one corner than to find the next one rushing up and it’s back on the brakes, turn in, throttle out, and then the next! By the time you are half way through one corner, you are preparing yourself mentally for the next. 300 km/h on the straight is the easiest part of the entire exercise, believe me! 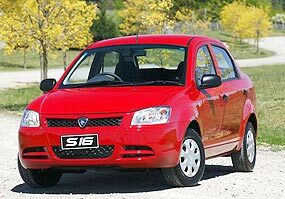 The price war sees another competitor enter the market - the Proton Saga S 16, which I believe will be coming to Thailand, when the market picks up. Australia gets a real cut-price version of the Saga by sacrificing a significant amount of standard equipment, including a number of key safety features that are standard on most of its direct rivals. According to the manufacturer, “Proton is known for its Lotus engineered ride and handling and strong styling and will now also be known for its market leading value.” This it does by making the base model without front passenger airbags or ABS brakes or electronic stability control (ESC). Proton’s S16 returns a relatively respectable 6.3 L/100 km. It has a 413 liter boot that embarrasses many larger rivals, and in Australia will be covered by Proton’s three-year/unlimited-kilometer new-car warranty. Is Porsche losing the plot? Reports in the media of a faster, lighter, more serious Porsche Boxster emerge ahead of its world debut at the Los Angeles motor show on December 2. Called the Boxster Spyder it is positioned above the regular Boxster and Boxster S, and it will be accordingly even more expensive. Designed to appeal directly to Californians’ penchant for stripped-out ‘Speedster’ versions of the 911 and Porsche’s iconic 356, it will get the higher-performance 235 kW/370 Nm engine from the hard-top Cayman S.
Apart from 7 kW of extra peak power and 10 Nm more torque, the new top-shelf Boxster is also about 80 kg lighter than the model upon which it is based. At just 1275kg, it will be the lightest model in Porsche’s entire range. That makes it the quickest Boxster with a claimed 0-100 km/h acceleration time of 4.8 seconds when matched with the optional automated twin-clutch manual PDK transmission and Sports Chrono Package with launch control. In the same configuration, the Boxster Spyder returns average fuel consumption of just 9.3 L/100 km on the European combined cycle (which is marginally better than the family Fortuner). However, although it is two-tenths quicker than the standard Boxster S, its roof must be removed for high-speed runs, one presumes because it might blow off at the 270 km/h top speed. The newest Boxster features lower side windows beneath a completely new, more lightweight and manually-operated canopy (Porsche-speak for you don’t push a button) that replaces the standard Boxster’s automatic soft-top system. Although power windows and mirrors are fitted, air-conditioning and a CD sound system will be optional extras for the Boxster Spyder. Other weight-saving cabin changes include a pair of lighter and more supportive bucket seats, plus belt-style door-pulls to replace the Boxster’s conventional interior door-handles. Just how primitive is that? 1955 MGA technology! 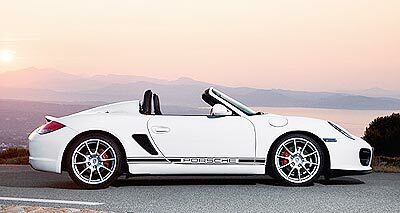 According to the factory blurb, Porsche’s most hard-core roadster is a highly modified version of a production model that attempts to recreate the formula pioneered by some of the Stuttgart-Zuffenhausen brand’s most famous race and road cars. The 550 Spyder of 1953 was the first Porsche sports car built specifically for racing and homologated for the road. Weighing in at just 550 kg, the mid-engined roadster proved victorious in a number of circuit and road races. 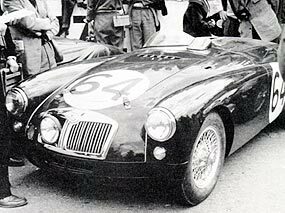 It was followed by the 718 RS 60 in 1960 and the name continues to be used by the RS Spyder Le Mans Prototype racecar today, but just who is going to buy this anachronism?